Facts and history about the life and lifestyles of Native American Indians. 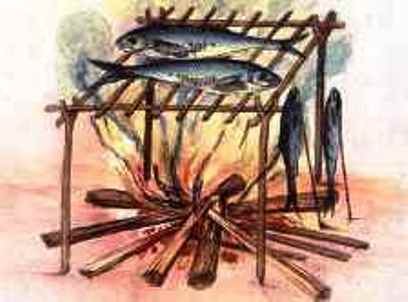 The Native American Indian Recipes varied from tribe to tribe and were dependent on the natural resources that were available in their location. What did Native Americans eat? Protein foods such as fish and meat were supplements by wild vegetables and greens, nuts and grains and berries and fruits. Domesticated crops included Corn, Beans, Squash, Tomatoes, Peppers and Potatoes. The traditional Native American Indian Recipes include Succotash, Popcorn, Clambake (Quahog), Buffalo Stew, Pinole, Popped Wild Rice, Sofkey and Sunflower Seed Cakes. The life, history and lifestyle of Native American Indians Native American Indians is a varied and fascinating subject. The following fact sheet contains interesting facts and information on Native American Indian Recipes and cuisine. The women of the tribes were responsible for the cooking and Native American Indian recipes were handed down from one generation to the next. The traditional Native American Indian Recipes and cuisine include Popcorn recipes, Succotash recipes, Sofkey recipes, Clambake (Quahog) recipes, Buffalo Stew recipes, Pinole recipes, Popped Wild Rice recipes, and Sunflower Seed Cakes recipes. For additional facts on cuisine refer to Native American Indian Food.